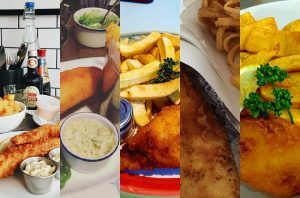 When it comes to fish and chips no one quite does it as well as Poppies Fish and Chips. Based in the bustling North-West London side, they offer customers a lovely dining experience. They aim to capture the joy of the 1940’s with their relevantly themed restaurant to bring about a movie-like nostalgia. They pride themselves on being able to bring the fun side of eating fish and chips even if you aren’t sitting on a sandy beach. So, what can one expect from this joint? Well, Poppies has a fantastic reputation. With kiosks located in both Camden and Spitalfields, this place will have you is great for any and every meal. Which is pretty great as they are opened from 11 am until 11 pm. This means you can pop in for a lunch break or pick up dinner on your way home, Poppies has you covered. Bring friends and children along as they consider themselves a family-friendly place. You can also expect great service from their chirpy, friendly and helpful staff. And, if you would rather stay in your pyjamas while you binge watch Netflix then you can make use of the Poppies online ordering service. Simply follow the prompts on their platform and await the iconic Poppies bicycle to beep at your front door. This allows for an extended duvet dining experience. Poppies isalso known for the black and white newspaper print packaging as they are for their tasty cod, halibut wild and haddock, a traditional way of serving fish. Add some side of hot fried chips or healthy option like a crispy seasonal salad or pickled egg. You can also look at their rather slightly more than exciting options of starters or take a pudding for the road.